City’s unbeaten start to 2019 was emphatically ended this afternoon against Dartford, the home running out comfortable 3-0 winners. The Darts had won the last six meetings between the sides and from the moment Noble lifted a stunning 25-yard shot past a rooted Ryan Clarke on 18 minutes, hopes of this dismal run ending faded fast. Up to that point City had looked the more lively of the two sides, Joe Raynes firing their best chance high over the bar moments before Noble’s wonder strike. However, the rest of the half belonged to the hosts. Hayes was denied by Clarke on 20 minutes but six minutes later a hanging cross to the far post was headed in by an unmarked Sheringham to make it 2-0. It could have got worse for City before the interval, Sheringham heading another free header over and Greenhalgh breaking clear only for Clarke to keep out his low shot with an outstretched leg. The second half started with City again on the front foot but any hopes of a comeback were dashed in the 57th minute. 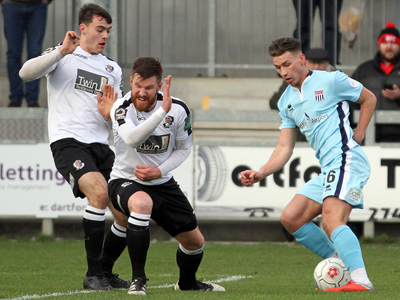 Ross Stearn saw his shot blocked at one end and Dartford broke forward where Roberts showed it was definitely the Kent side’s day, curling another long-range effort beyond Clarke’s despairing dive. City continued to try to pass their way back into the contest but were largely restricted to efforts from outside the box that, apart from several fumbles by shakey keeper Vose, never really threatened even a consolation goal.